The b iopharmaceutical company is now one of the 62 start-up companies in the Innovation Center for Biotechnology in Martinsried near Munich. Planegg / Martinsried (Germany) – June 9, 2016 – Today, Bicoll Group announced that it has been selected by the Fördergesellschaft IZB mbH which operates the Innovation and Start-Up Center for Biotechnology (IZB) to join the leading European center for medical biotechnology. Along with the headquarters in Martinsried, Bicoll operates its laboratories in Shanghai, P.R. China. “The opportunity to relocate the company’s headquarters to the IZB in Martinsried supports the company’s growth enormously. The direct integration in Europe’s leading biotech cluster allows Bicoll to accelerate both the current development efforts, as well as relations with other academic staff, top-management and investors on site”, said Dr. Kai Lamottke, Managing Director of Bicoll GmbH. “Bicoll has already developed a very good reputation in the field of drug development. We are happy to welcome Dr. Kai Lamottke not only as a distinguished entrepreneur, but also as an excellent networker for our globally recognized hotspot for Life Science in the IZB. As one of the first members of the Faculty Club he is contributing to the intensive networking between scientists, entrepreneurs and politicians. The IZB entrepreneurs certainly benefit from the excellent contacts that he has built up in recent years in China”, explains Dr. Peter Zobel, Director of the IZB, about his decision to offer the space to Bicoll GmbH in the IZB. Bicoll’s technology supports the fastest small molecule approach from the initial screening to the first animal data; even inthe complicated settings such as for example orphan targets, rare diseases, as well as in the field of plant protection, nutraceuticals and cosmetics. Bicoll’s starting points for the drug development have higher chances to succeed – to make the entire process from the early stage drug development to the product. The enterprise company IZB GmbH, established in 1995, is the operator of the Innovation and Start-up Center for Biotechnology in Planegg-Martinsried and Freising-Weihenstephan and is one of the top ten biotechnology centers in the world. 62 biotech companies with more than 650 employees operate in 26,000 m2. An important criterion for the success of IZBs is the proximity to excellence of the Ludwig-Maximilian University and the renowned research institutions involved in biotechnology on campus Martinsried, such as the Max Planck Institutes of Biochemistry and Neurobiology. The enterprise company IZB mbH is a subsidiary of Bavaria State. The aim is to support the creation of life science companies and contribute by leasing out suitable premises for the economic implementation of research results in the field of life science. Therefore young entrepreneurs and company founders in the field life science find here an optimal infrastructure for economic implementation of their product or service ideas. 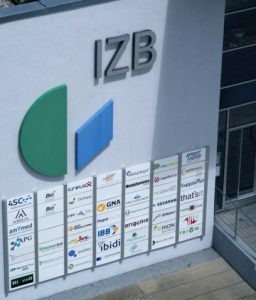 The IZB supports its companies with financing, business issues, partners search, negotiations in the scientific network, trade fairs and marketing activities and conversions.